Daniel Ross braves high waters to experience the brevity of Mark E. Smith, the joy of drawing a long-eared owl, a new Natasha Khan side-project and some intense Brecon clouds. Pitching up on the Thursday afternoon means you get a little extra at Green Man, in the shape of patriarchy-slamming Welsh-language disco-native Gwenno, folk soundscaper and winsome crooner Peter Broderick, dance-off instigator Dan Deacon, and Leftfield. Which is quite a good start, really. Unsurprisingly it's Deacon who fits the celebratory mood best and, after a grumpy beginning where he berates the sound crew for not making his magic sound boxes work in time for a prompt start, it's a cavalcade of wide-eyed positivity. It only takes about 10 minutes for him to pit two hapless but game revelers against each other in a beautifully uninhibited dance-off, and coupled with renditions of his hyperactive, relentlessly joyous recent work, it is a true happening for pissed people with their out-of-office correctly set up. As Dan Deacon correctly pointed out during his set, the weather changes every 45 seconds in the Glanusk Estate. This seems to be the story for much of the weekend, where foolishly leaving one's kag-in-a-bag in your tent because "look, it's really nice now, don't tell me I couldn't eat an ice cream," can spell disaster and hypothermia. There's a spell on Friday, during Natalie Prass' gorgeous set of dallying heartbreak hymns, when the sun beats down through the clouds and it truly feels like a festival that you could put on mainstream telly. To counter that, the final 45 minutes of Super Furry Animals' Saturday night is a gradual, soggy process of having one's positivity steadily removed as thoughts turn to the levels of the nearby River Usk, and if it might fork its way directly into your tent. It was often said of Women, the band that imploded and then became Viet Cong (short version), that they were a surf band at heart. Thanks to drummer Mike Wallace it's an influence remains in Viet Cong, but judging by their performance on the Far Out stage it's one that Dennis Wilson would find absolutely unrecognisable. For Wallace and the rest of the band, the impish rhythms of surf are a gateway to something far more monstrous. Their hugely extended take on recent album-closer ‘Death' is a relentless battery, a mulch-like ensemble sound that Wallace seems to control with an always-surprising offbeat smash. After about ten minutes, he's a wreck but still trucking – and there's just enough left in the tank to power through the song's final gear change. File alongside John Stanier and Greg Saunier as one of rock's most entertaining drummers. Allen is the current leader of Sun Ra Arkestra and, under his subtle, supportive leadership, his band are a burbling, tense mass of not-quite melodies and exploded half-songs. The delicate 5/4 of ‘Angels and Demons' is sustained by one of history's most perfect basslines, but it's the only true anchor in a set that veers beautifully and dangerously through various levels of control and freefall. Clearly, it's a formula that still delivers - Allen's flute and EWI are so beloved by the audience at the Far Out stage that the techies begin dismantling the stage set-up around him while he toots wildly into the air. He only contemplates leaving the stage when he is the only person remaining on it. Thanks to their heavy involvement in the superb Atomic Bomb! project that brings the music of Nigerian psychedelic funk godhead William Onyeabor to life, Hot Chip are the lasting impression of Friday night. It's almost incidental that they headline right after the Atomic Bomb! band leave the stage, but both sets are muscular fun – especially when one of the Mahotella Queens falls flat on her arse during a misjudged dance move to a particularly rampant Onyeabor number, only to stand up immediately, overcome with laughter. Also, Alexis Taylor spends much of the evening in an ostentatious white hat and coat that make him look like Jon Ronson dressed as Boy George. Absolutely the sunniest moment of the weekend, though, is when the sexagenarian filth-monger Charles Bradley takes the Mountain Stage, romping around like an impetuous toddler (albeit with a graphic and detailed knowledge of sexual mimes) and enlivening a heat-drowsy crowd of thousands with his bullet-point funk set. It's a lesson in the value of the nonsense-free stagecraft so beloved of the Daptone stable and, down to every last left-together/right-together foot stomp from the horn section, it's tight, tight, tight. The Mountain Stage at Green Man is one of festival-land's greatest gems of appointment, flanked on all sides by mountains and bottomed out by a very convenient hill for families who bagsy their spots like German tourists and settle in for the entire day. But beyond that, there's a jacket of wet cloud around the edge of the whole festival site that might not literally serve as a sound barrier, but it certainly brings a feeling of remoteness and separation, perfect and essential for any festival. If there is a world outside of the clouds, something further than Abergavenny, then it's invisible and unimportant while you're here. We're very late along to catch Mark E. Smith in interview at the Talking Shop tent, but as it happens the final minute and a half was as much entertainment as you could ever need. Seeming bored and incensed by a question submitted by Stewart Lee, Smith declares the comedian a liar and rises from his chair, saying that he has a soundcheck to do and if there was any ‘audience thing' planned, then he's not doing it. Brilliantly, doing so leaves his interviewer trapped in a beautiful space between bafflement and panic, while trying to make it all appear completely expected and acceptable. A highlight. The first live appearance from Bat For Lashes' Natasha Khan, Dan Carey and the members of TOY, otherwise known as Sexwitch, is listed in Green Man schedules as a secret, special guest. It's also wanging it down with rain at 7pm on Saturday, so the tent-sheltered audience is perhaps bigger than expected. Still, once the word ‘Sexwitch' is uttered by the compere, that's it. From where we're standing, relatively near the back, the exiting stream of terrified-looking kids and worried parents rapidly clamping ear defenders on them means we're mid-tent within a minute. It's a shame that a lot of people didn't seem to get past the name and the unrelentingly doomy strains on display, because there are signs of something worthy within all the elaborate posturing. That posturing comes mostly from Khan, who drops to her knees with alarming frequency and bellowing seemingly improvised, wordless fragments of melodic interest over TOY and Carey's rigid Kraut-influenced backings. Those less structured offerings are by far the weakest parts as Khan clamours for direction, perhaps overcompensating for its absence with histrionics. But when the whole sound, vocals included, is as controlled and taut as the rather smart backing, there are one or two moments that approach a small majesty. All of these songs are, surprisingly, covers – translated renditions of Moroccan, Thai and Iranian psych songs put through a quite inimitable filter. It's unquestionably the harshest sound that Khan's ever produced, but the sheer shock of it alone doesn't always equate to a satisfying listen. With remarkable simplicity, self-styled psychedelic ornithologist Matt Sewell is able to render a menagerie of different garden birds, and we're all encouraged to draw them along with him. Want to draw a long-eared owl? Start with a square. Want to turn a blackbird into a songthrush? Add some dots to the chest. And did you know that the red of the robin's breast extends over his face? Sewell is a quiet master and gentle tutor: we leave with our jotters full of more-or-less passable imitations of wrens, chaffinches, tawny owls and kingfishers. 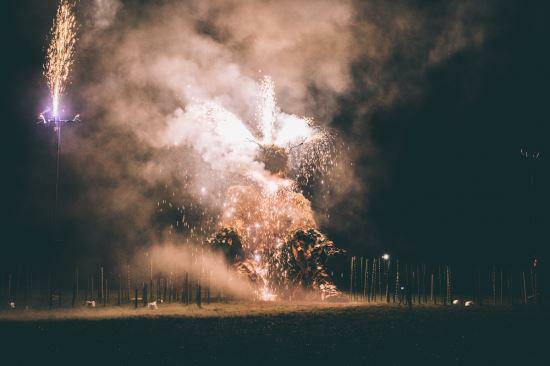 We leave with the sense that this kind of activity is as much a part of Green Man's mission as any amount of folk twanging or psych riffing – a rare separator between this festival and its similarly orientated cousins like End of the Road and Latitude. This article originally used the words "hysterical" when referring to Natasha Khan's performance. The Quietus sincerely apologises for this editorial oversight.